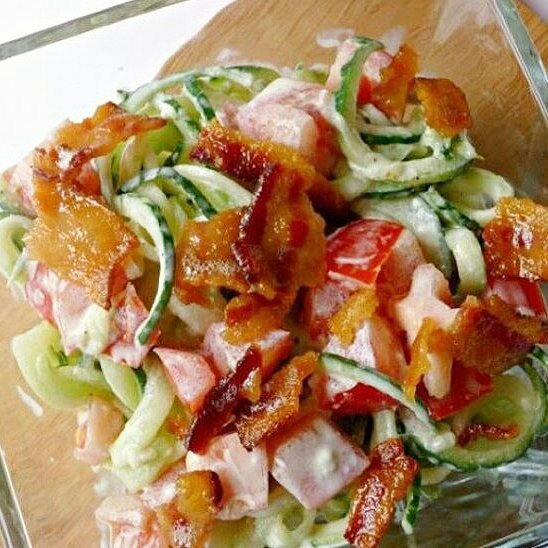 Bacon Tomato Cucumber SaladCucumber Salad! Making this for lunch today but tweaked the recipe to clean it up a bit! Greek yogurt vs mayo & 1/2 turkey bacon with 1/2 reg good ol' bacon to lighten it up a bit! Still delish! Add in your tomato, spices and Greek yogurt then stir. Crumble up the cooked bacon & sprinkle on top.